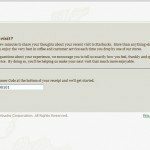 All About MyStarbucksVisit.com – What the customer needs to know! Have you ever been at a Starbucks, and the register prints out an extremely long “survey” receipt? 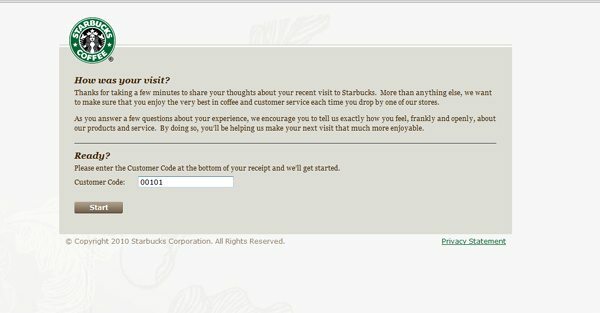 That’s an invitation to complete a survey about your Starbucks experience at MyStarbucksVisit.com. Don’t throw this receipt out! Complete the survey! These receipts appear to print out very rarely. From what I can guess, it appears to be only about one survey every 500 or more customers – don’t count that as written in stone! I just know for sure that these receipts are rare and every single one of them count. 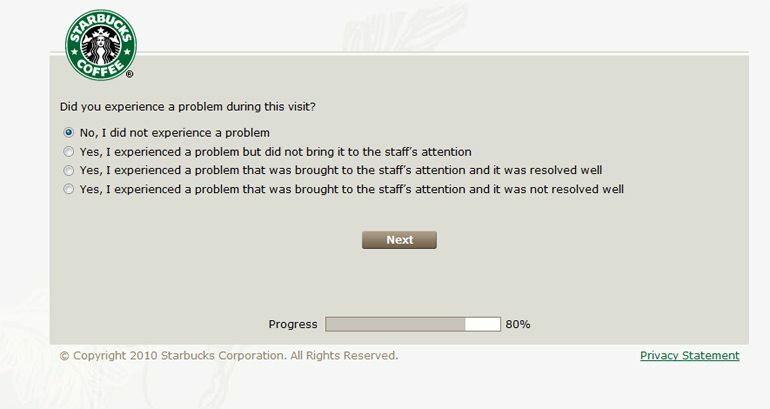 I’ve occasionally wondered how Starbucks can obtain meaningful survey results with a sampling of only maybe 35 to 40 customers in one month when the store may see over 15,000 customers in one single month. On June 21, 2010, I was at my local Starbucks, and I bought multiple items. I purchased about four items, and asked the barista to split the purchases into two transactions to earn more stars. The barista very happily broke up the transaction as per my request, and the second receipt, which included a fruit and cheese platter and Ethos water, produced the survey receipt. How Was Your Visit: The next screen asks the customer “How Was Your Visit” and asks for the entry of the customer code that appears at the bottom of the receipt. One can notice that every code for MyStarbucksVisit begins with the store number where the visit occurred. In this case, you can see I visited store number 101. (This is NOT the Pike Place Store. It would take a lot of work to explain the numbering system, so I’m not going to sidetrack to that here). Finally, we’ve entered in the long code, and we begin our survey. The very first survey question asks whether your purchase was for here or to go. As I recall, I bought a snack to take back to my desk, planning on working a little late (often the case on Mondays for me) and so I have answered “Took Purchase To Go”. What type of beverage: Hot or Cold? We’re on to the next question. 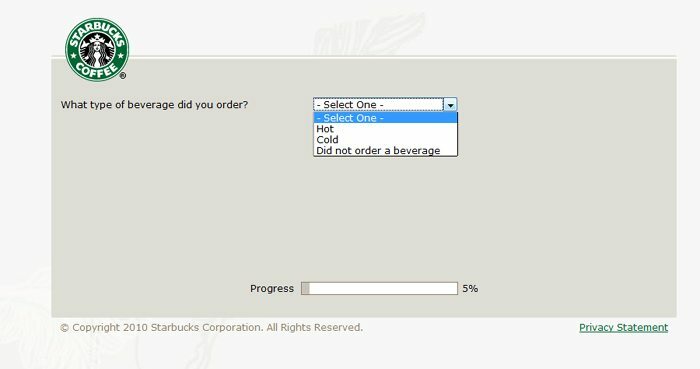 The next question asks the participant if he or she purchased a hot or cold beverage, or one can select the option, “did not order a beverage”. This question hasn’t changed in years. This is not the first time I have completed one of these survey receipts. The one thing about that question that has irked me in the past is that it never contemplates that a person might be purchasing more than one beverage at a time. There are times that I will get both a hot and cold beverage at once. Remember, I had indicated that I was having my purchases rung up separately (or mostly so), and so on this visit I had ordered a Strawberry Banana Vivanno with dark cherry syrup added. I will select that I purchased a “cold” beverage. However, I can think of many times in the past where I have received a survey receipt, having ordered a drip-brewed coffee, a cold beverage, food, and even maybe a small Horizon vanilla milk too. The survey should consider that a person might have bought more than one item to drink. What specific beverage did you order? Next, the survey wants you to answer specifically what beverage was purchased. In this case, I am going to answer a Vivanno, despite that that was an the receipt immediately before this one. A Vivanno is a lot more fun to talk about than an Ethos bottled water. This is another area where I’ve been mildly irked by the choices before: The choices don’t contemplate that anyone would ever order an Iced coffee from the Clover which is NOT the same thing as a standard iced coffee. However, there is a selection for “other” perhaps for that kind of situation, or other unusual beverage requests such as perhaps plain milk, plain apple juice, or any number of very non-standard ingredient combinations. Whole Bean purchase? The next question asks if you purchased whole bean this visit. Here, my answer is “no”. I certainly have purchased plenty of whole bean from this Starbucks before, but I didn’t happen to on this particular visit, so the accurate answer is simply “no”. The next question inquires whether a Starbucks Card was used for the purchase. I have answered “yes”. I always pay with my registered Starbucks Card. The next question asks whether the visit was eligible for any Starbucks reward? The answer is “no”. Although I got dark cherry syrup in my Vivanno, I still did not receive any special reward: That syrup is always charged for and is never a free syrup. I assume that the question is not asking the overly obvious question of whether I was earning stars because every transaction is earning stars with a registered card. So the right answer here appears to be “no”. Whew. Now the survey is beginning to feel long and tiresome and we’re only 27% through it. We’ve got to keep going. 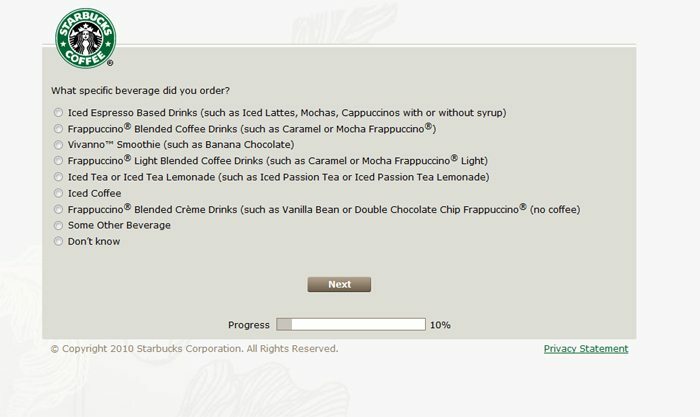 My baristas will be annoyed with me if I gave up on the survey. Next question asks “did you order food“? I will answer “yes” because in my mind, buying the cheese and fruit and crackers platter counts as buying food. Next question inquires more specifically about the food purchased. The question is “What food did you order” and you can check all that apply. Here, I’ve indicated that I bought a “plate” because it seems to fit the best of the options. I had to debate a little which was the best fit, but I think the “plate” makes the most sense. The next question wants to know if I was “satisfied overall with my visit to this Starbucks.” Now here’s something important for my readers to know: I have heard baristas gossip that unless their stores get a “highly satisfied” they’ll suffer flack from those above them. I don’t know if that is really true, but if you have any thought that you like your baristas, please answer “highly satisfied”. It’s a trick question! One might think that you get partial credit for just being satisfied, but it appears that these questions function more like a pass/fail test with “highly satisfied” as pass, and all else as “fail.” This is a big issue: I can remember one store manager confiding in me how upset she was at low scores – If even just one or two people are merely satisfied and not highly satisfied, it will throw off that month’s results. While an ordinary customer might think that being “satisfied” is great, the store may receive great pressure to improve because their customer voice metrics are not good enough. And this might be in the face of a store where there are lots of very satisfied customers, yet a small percentage of results can create very unpleasant experiences for the store. My story about the store manager confiding in me doesn’t have a happy ending: She left Starbucks after having been a partner for over a decade and having managed several stores. 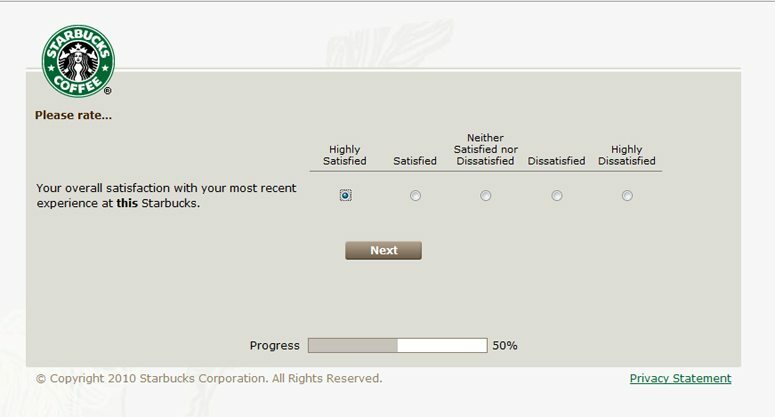 And again, following in the same pattern as the question before it, here’s another chance to tell Starbucks partners above the store level how “highly satisfied” you are with your store. This question asks about speed of service, cleanliness, and skill of the barista. Next question asks if the customer was highly satisfied with the taste of beverage and food, and the experience of using a card. Once again, I have indicated that I am “highly satisfied” with my store. We’re getting there. I know this is getting painfully long. Next we’re asked if we’re highly satisfied with the price we paid. Of course I said yes again that I was highly satisfied. This is one of those questions that seems completely to be a waste of time on the survey – It seems to presume that the barista has some control over the price paid. The barista has little control, outside of perhaps minor changes to the price with syrups or milk changes. Certainly, my barista at the register didn’t set the price of a cheese platter. And honestly I think dark cherry should be a free syrup because it seems to be a poor brand experience to say, “well, you get free syrups, … except with these minor stipulations and exceptions.” But again, my local barista never set the price of a cheese platter or the cost of adding dark cherry to a Vivanno, so I’m always just going to say “highly satisfied” to this question, lest my barista be dinged over something that he or she has no control over. Next we’re asked if we experienced a problem. The answer is definitely “no”. This visit to Starbucks was a nice normal visit of friendly baristas who all know my name and drinks. We’re getting there. Not too many more questions. Now we’re asked about returning to this Starbucks or whether I would recommend it. The question specifically asks “based on this visit, what is the likelihood that you will return to this Starbucks in the next month?” The answer is definitely “yes”. According to the survey, I’m 83% of the way through it now. 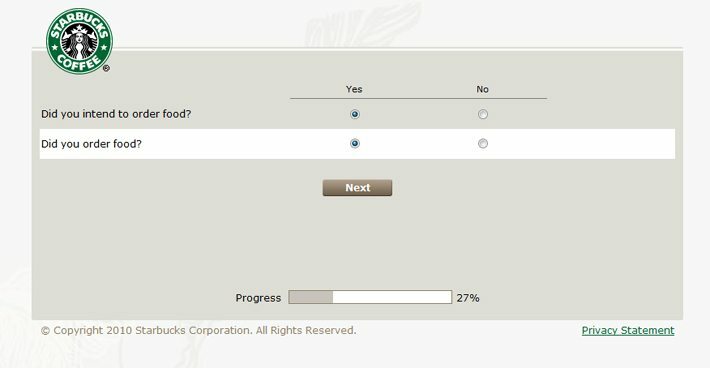 Finally we get to a point in the survey that is a free form box. Finally a chance for the customer to speak to Starbucks in an open-ended non-structured way. In order to really capture what is happening in the experience, a few well-chosen words can be much more powerful than a scale of one to ten. This section of the survey has a character limit of 4000 characters. This too has developed and changed over time. 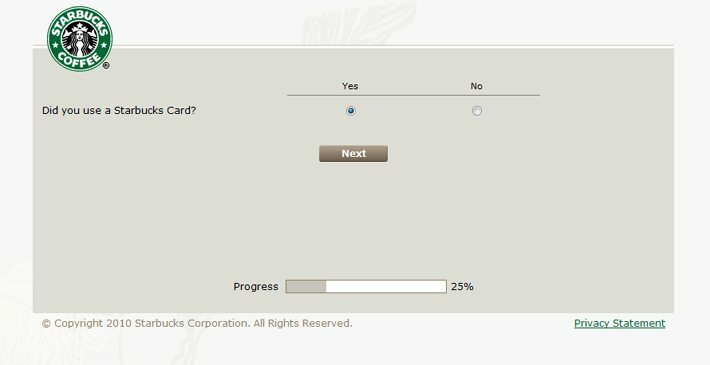 I clearly remember that in 2008 these surveys had a small character limit for this box, I think in the range of 300 or 400 characters. I don’t remember exactly how it happened, but I did complain to several moderators on MSI that it would be impossible to describe a visit you had, a problem, and how it resolved, either favorably or not, in so few characters. Shortly after my loud voice about the character limit, it changed in late 2008, removing the character limit entirely. I don’t really think this was my doing, but I thought it was a good change. It appears now that there is a character limit again, only this time allowing a person to write quite a bit. And now we’re cycling back to yet another question about my Starbucks card used as the form of payment. Yet another question which should be straight-forward but is not. 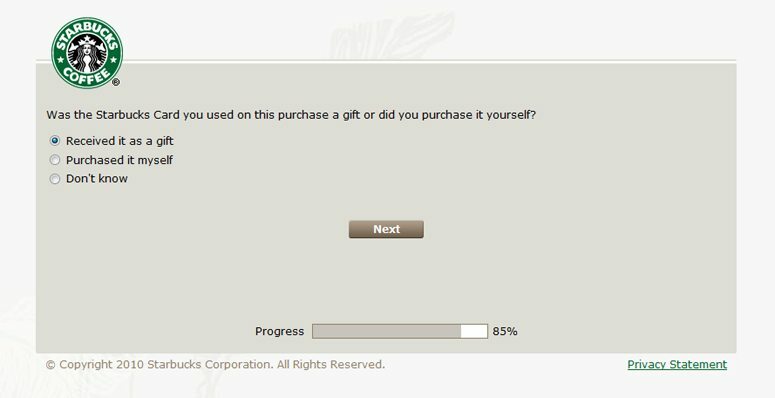 The survey asks me if my card was a gift. I used my black Gold Card to pay. Just to repeat, as every barista should know, when the ten-percent discount expires, the black version of the Gold Card immediately (and automatically) is rolled into MyStarbucksRewards. A customer can pay for their purchase with ANY registered Starbucks card at the Gold Level and receive all the card perks. There is no reason to switch to the gold version of the Gold Card. I have continued to pay with my black Gold Card. It’s so unique, and has Howard’s signature on it (though almost impossible to read at this point). My black card was a gift to me from Starbucks. In October 2008, Starbucks sent out a “few thousand” free black-version Gold Cards, as pre-launch free cards for customers. Most people paid $25 for their card, but I did not. I got mine free. Of course, it did not come pre-loaded with money on it. Wouldn’t that have been nice? But the card itself was a gift from Starbucks, so I am going to answer that the card I was using was a gift. The next question, again on the topic of my card, asks how receiving the card influenced my purchasing decision. I think it’s pretty obvious that I would go to Starbucks whether or not I had a Starbucks card in my hand. Overall though, the cards probably have helped me spend a little more, but notice that is not the question that Starbucks asks. 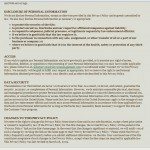 Starbucks asks about card use in relationship to frequency of visits at Starbucks or other businesses, and does not ask for a comparison of personal spending AT Starbucks with or without the card. The next question is harder to answer. It asks about frequency of visits during the course of one month. I would note that I remember that this question used to end at 16 times per month, but now considers that a person might go to Starbucks up to 31 times in one month. I am struggling to figure out the right answer. There are days where I skip going to Starbucks. On the other hand, Monday through Friday, I visit Starbucks pretty regularly. The answer is probably between 25 and 31 times per month, and on the high end of that, but to give a conservative guess, I’ll select 25 times a month. We’re almost done! Towards the end we’re filling out demographic information. Though I think Starbucks knows I’m a female in Seattle, but we’ll tell them again. Next screen is the very end! The survey gives you a code to write down (I have blacked it out here). Write down the code and take your receipt back to your local Starbucks for a free tall beverage! Whew! It was a ton of work but we just filled out an entire MyStarbucksVisit survey receipt together. So dear customers, now you know what to expect! Please don’t throw these surveys away! “What Customers Mean to Me.” (Guest post by a 4-year partner). Commentary: Starbucks Brew On Demand – The experience in the stores. 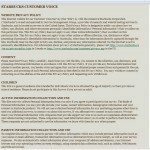 Your Starbucks Experience: What you shared. I walked into a local Starbucks yesterday and as I ordered my drink I could see somebody’s receipt with a treat receipt attached still sitting in the machine (belonged to the person before me waiting for their drink)? I asked for my receipt, and watched as they ripped off the receipt with the treat receipt and placed it on the counter by the till. They then printed and handed me my receipt. Who knows who they were saving the treat receipt for? But, these surveys are very often not going to random customers as intended. I have two passes for free starbucks that expiration date is May 31 2011. I did three surveys and still didnot get right ID for free beverage. So I have missed out. I went onto a StarBucks with my survey coupon and was told I could not use it in there store. I was informed that I could ONLY use it in a department store with a StarBucks in it. OK, away I go and went to a Target with a StarBucks. Again I was informed that they did not honor the coupon. My last resort was to go back to the StarBucks where I received the survey coupon. To me someone has to get everybody on the same track. If I was informed all this at first I would have not even saved the coupon. That’s my story. 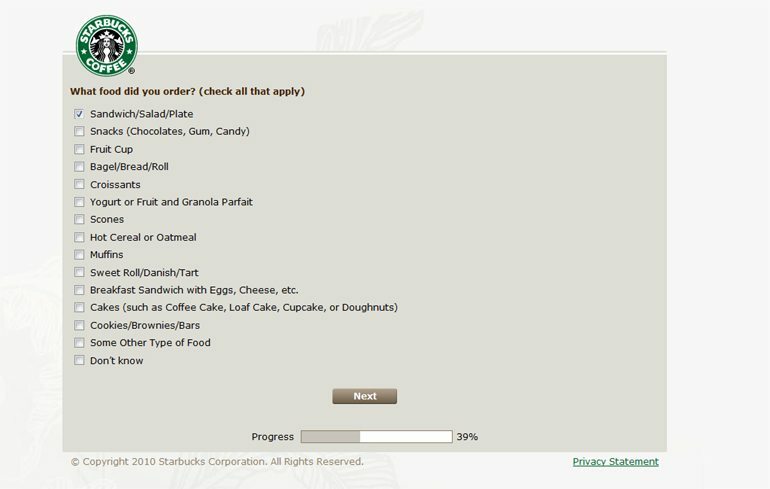 I entered MyStarbucksVisit.com to take the survey (not really knowing what type of survey it would be…stupid me for not checking) and I entered up taking a 15 minutes survey about products that were not related to Starbucks. After I submitted the survey, thinking that was how I would get the free drink code, I realized there was no code to write down and the e-mail said I would start receiving my coupons in about 12 weeks. 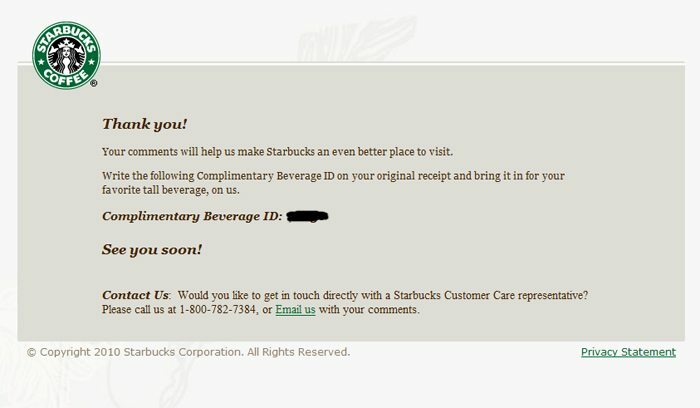 I don’t know what the link was that took me out of reviewing my Starbucks visits but Starbucks should check into this issue – I will be real upset with Starbucks if they have partnered with a survey company on products other than Starbucks. Hi Laiura! Welcome to my Starbucks blog. Hope you’ll look around and click “like” on the blog’s facebook page. I’m really curious about what you wrote. I have to ask you a few questions. Was this a survey that you received at the register (and attached with your receipt) from the register barista? 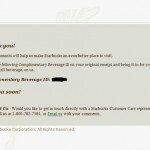 I remember reading a mystarbucksidea.com thread where a person said something very similar to you – She took a long survey, and there was no code for a free drink, and that it was just a big product survey. 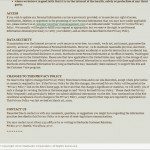 My guess is that somewhere out there, there is a scam survey which is designed to look like a mystarbucksodea.com visit survey. 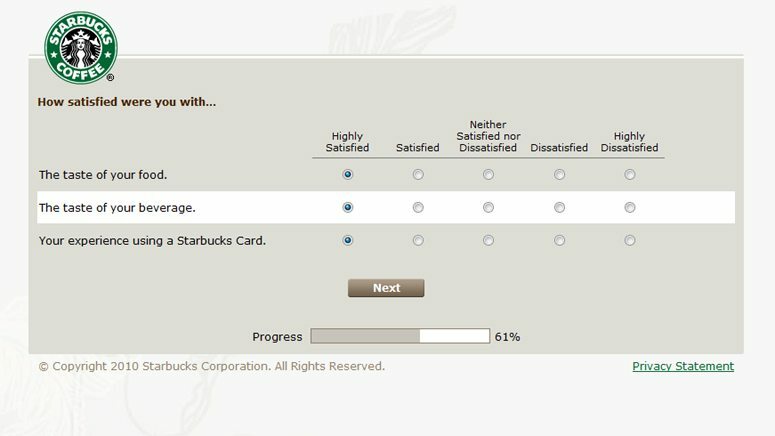 Your mystarbucksvisit.com survey really should look like the images captured in this blog post. It won’t be exactly the same because Starbucks does change a few questions now and then, but it will look a lot like the screen caps above. I’d love to hear more how you got the survey. Like I said, it really should be something that a barista at the register, and inside the store hands you. I am sorry you got taken by a fake survey. 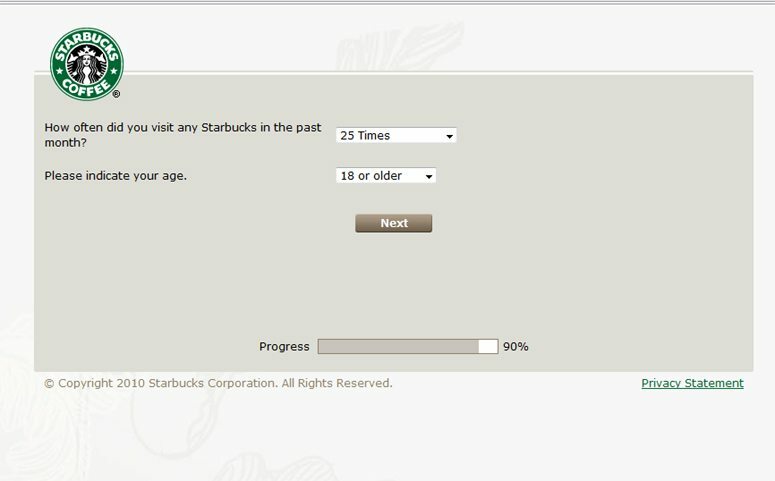 I don’t think you took an official Starbucks survey. You’re not alone. As I have mentioned, I’ve heard about this happening to others before. If you still have any info about the bad links that got you the bad survey, I would report them to Starbucks. I deliver mail , and everyday I go to the starbucks at manokeek shopping center and order a large frap caramel. I am not a coffee drinker but I love starbucks frap caramel. The associates that work there are very friendly and helpful. 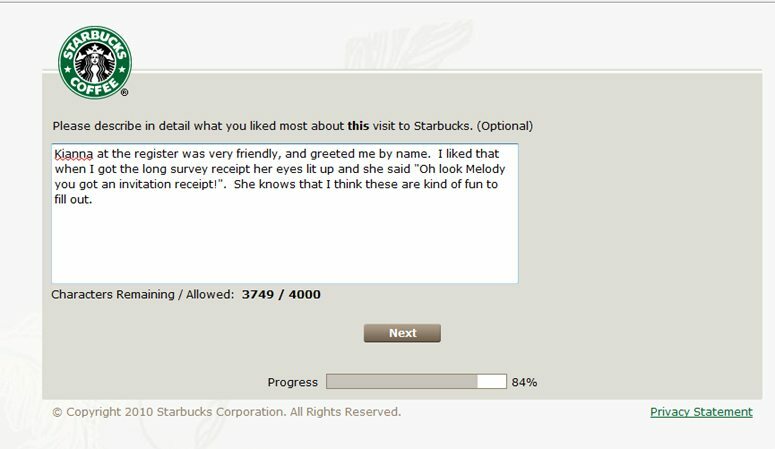 Hi Dinah – In order to comment on “My Starbucks Visit” you have to have received a special receipt AT your local Starbucks. 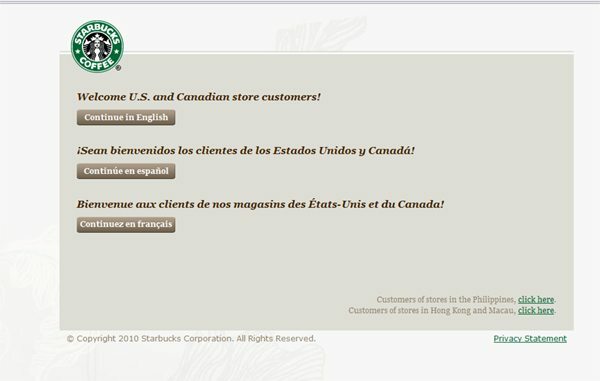 Now, I have unfortunately heard that there are a few scam-like sites out there that are NOT run by Starbucks. First question: Do you have a receipt that looks something like the image that is in this thread??? If someone is asking you to do a survey, but it did NOT come from a wonderful in-store barista wearing a green apron, it might not be a Starbucks survey. 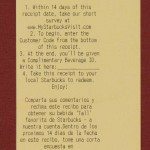 Next: If you got a receipt from a barista in the store (and again, it will look something like the one pictured at the very top of this thread) then go to http://www.mystarbucksvisit.com and begin the survey. There will be a long number on the receipt. Then just work through the survey. At the very end, you’ll get a number to write ON the receipt, and you take that receipt back to a store for a free drink. The key here is the special receipt FROM the baristas in the store. Follow the instructions on it carefully. Writing in all caps is considered “yelling” on the internet. I am just honestly trying to help you – one customer to another. Please do not yell. If the information in this comment does not answer your questions, please call the customer service number above. i have been a partner for 10 years @ starbucks coffee. i cannot tell you how many urban myths i’ve heard. i do wish the average customer would understand the difference between “licensed” stores and company operated ones. the stores in target, airlines, casinos, hotels, etc. are licensed. they are employees of said company, not partners for starbucks coffee co. they use starbucks products, sometimes allow you to use rewards card OR issue a customer survey. they are not a starbucks coffee co. operated store-hence the differences. also, the “treat reciept” & customer survey are totally seperate things. the customer survey does make a difference, our district mgrs. do look @ them and read comments left by our customers! it is true that some partners save the survey for “regulars” in hopes to sway results or to give favorites a free beverage. in any case, starbucks is a savvy company & is more than likely finding (or found) a way to track those that cheat the system. dont get me started on ALL the ridiculous ways customers try to cheat us out of a drink!!!!!! i don’t think any other retail/food service place is conned more than starbucks. i look @ it as karma, what goes around comes around!